Calling all kids…We have a fun competition for you! Do you like to build things and go fast? This is your event! Scrounge up some construction materials and design your own awesome soapbox vehicle. Boys and girls ages 6-14 may participate. Simply line up on the Main Street Hill on Friday at 5:00 PM in Downtown Stanton. Then, show how fast your soapbox can take you down the hill! Get started today on your soapbox creation so you are ready for this fun event. Wheels and other building supplies, if you need them, will be available for sale at Rolston Hardware. There is no cost to participate in this event. Race over to the link below for rules, registration and permission forms or make a pitstop at Rolston Hardware, the host of the Soapbox Derby. Wanted: Kids with STRONG legs! 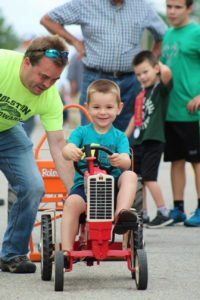 The Pedal Tractor Pulls, hosted by Rolston Hardware, will be held on Main Street in front of Rolston Hardware at 10:00 A.M. Saturday. Children 3 to 10 years old may compete. Pedal tractors will be provided; just show up to enter this event. There is no entry fee, and no pre-registration necessary. Prizes will be awarded. Kids test your speed, get in your drag race car and pedal away. The Pedal Drag Races, hosted by the Brick Yard Bar & Grill, will be held on Main Street in front of the Brick Yard after the Pedal Tractor Pulls on Saturday. Children 4 to 8 years old are invited to compete. No pre-registration or fee is required. Come as you are and get ready to hop in one of the provided pedal-powered race cars.